Glyder Fawr is a mountain in Snowdonia, North Wales. At 999m it is the highest mountain in the Glyders Range of mountains. Glyder Fawr is accessible from trails starting at either Nant Peris in Llanberis Pass or Ogwen Cottage in the Ogwen Valley, Conwy County. The mountain is popular with rock climbers and hill walkers. The summit marks the boundary of Gwynedd and Conwy County Borough. Glyder Fawr sits between Glyder Fach 994m to the east and Y Garn 946m to the north west. From the North exit the A55 at Junction 11 head south through Bethesda to Pont Pen y Benglog (Ogwen Cottage). Car Park side of road. From South (Betws-y-Coed) follow the A5 North West through Capel Curig to Pont Pen y Benglog (Ogwen Cottage). Car Park side of road. 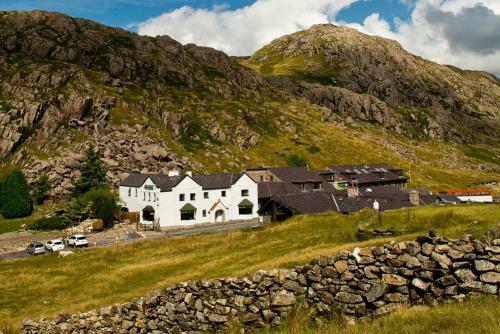 Walesdirectory.co.uk, where you can find where to go, what to see, and where to stay in Nant Peris Wales.